Recently I went to a friend’s house for Shabbat dinner. She asked all of us to bring our candlesticks and candles with us, and as the sun sank in the sky, we lined them up on the dinner table and lit them! It was a beautiful display. Every set of candlesticks had a story. Some of the stories were simple: “These were my mother’s,” and some were long and involved. Some came from Israel, some from Walgreens. One set came from eBay. Some were very fancy (the ones from eBay were silver and pre-war Polish) and some simple (one set had been made in religious school by a now-grown child). I’ve lit Shabbat candles in lots of places. I’ve scrunched up aluminum foil for “candlesticks,” or lit tea lights, and when I was a chaplain in a nursing home, we had electric lights. There’s nothing quite like the glow of a real candle, but even the little electric lights said “Shabbat” to us. 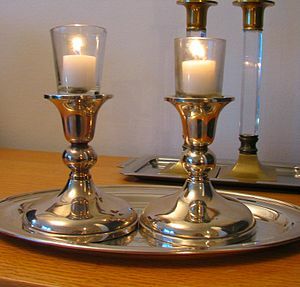 As we look forward to lighting the Chanukah candles, let’s pause to enjoy our Shabbat candles this week. Chanukah is fun, but it only comes once a year. The faithful little flames of Shabbat are there for us week after week, bringing comfort and joy. May your Shabbat be a time of true rest, before the razzle-dazzle of Chanukah and the preparation of the Thanksgiving feast.